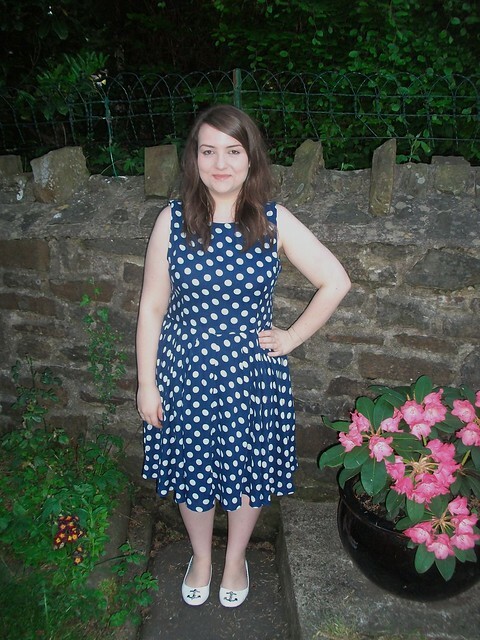 I've been fretting about what to wear to the Cardiff Blogs Jubilee Big Lunch for ages (if you live near Cardiff you should come!) I wanted a 50s style dress but nothing with a Union Jack or London type print on that I wouldn't be likely to wear again. AX Paris recently contacted me to let me know that they have now launched a curve range which sells clothes from a size 16-26. This was great news for me because I always see their clothes on ASOS or in New Look stores and like what I see but they only stock up to a size 14. I was able to pick something from the site to try out and I went with this navy dress . I wore the dress to work when it was really hot a few days ago, it's nice and long so it's suitable for work and it is very light and cool. I wouldn't bare my legs in a short skirt or sit down for a picnic in one so this is the perfect length. I'm going to wear the dress with some red pumps, my Vivienne Westwood earrings that are red and a splash of lipstick (red, of course) when I'm celebrating the Jubilee. AX Paris currently have 15% off some lovely dresses in red, white and blue for the Jubilee until the 6th of June and I think they are offering 20% of your first order when you fill in the form that pops up when you open the homepage. I'm really looking forward to this weekend, it will be a blur of Pimms, dancing, picnics and cake. My friends have all finished their exams today and we are going to celebrate in style! I'm also heading to the Hay on Wye book festival on Monday, are any of you going to be there this year? Are you doing anything for the Jubilee and what will you be wearing? 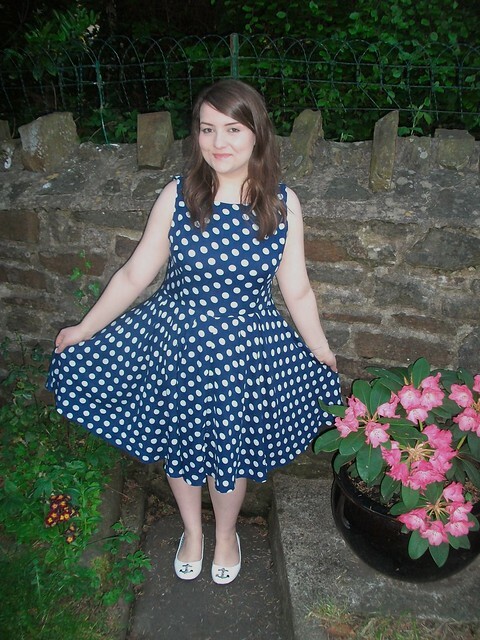 I always liked the AX Paris range when I was in New Look - they do some really nice dresses - looks lovely on you! This is such a cute dress and I like how you paired it with the nautical ballet flats. I'm always excited to see companies expanding their line to the plus sized market. You look lovely! You look beautiful, I love you in polka dots! I've been eyeing up this dress and the yellow one for a while. How did you find the sizing? It looks gorgeous on you! That dress looks lovely on you! AX Paris have some really nice dresses :) Have fun at the Jubilee big lunch! That dress is so lovely on you, it looks like the perfect summer dress! Hope you enjoy the long weekend, sounds like you've got lots of lovely things planned. That's so great to hear that AX Paris are doing larger sizes now, sometimes the 14's can be a bit of a squeeze for me! Oh I do love this! I like finding nice flattering dresses that are also long enough to be work appropriate! your anchor flats are very cute! and I wanna let you know that I'm having a Summer Fun Giveaway : ) Hopefully you enter!